I was only there for a day but that's all the time it took for me to fall in love with Rockport - Fulton. The scenery alone was worth the trip but there's so much more than just beautiful seascapes. Fishing is one of the most popular activities, in fact some say Rockport - Fulton has some of the best redfish and trout fishing in the world. For a leisurely fishing experience you can try one of the fishing piers at Rockport Beach Park, early morning on an in coming or out going tide is the best time to try your luck. If you get there early ( before the booth opens ) they won't charge you the $4 entry fee, you can also ride your bike or walk-in for free. There's also some excellent fishing at the Fulton Fishing Pier, there's a $2 per pole fee, pole rentals and bait are available at the snack shop. Copano Bay Fishing Pier is also an option, this 5.9 acre park is a favorite for locals. Located five miles north of Rockport at Aransas Pass. If you're feeling a little more adventurous you can hire a guide for a day of fishing the bays and flats around Aransas Bay. Or if you'd like to take off on your own try renting kayak, the friendly folks at Rockport Birding and Kayak Adventures would be happy to rent you one. Facebook Likes are greatly appreciated! 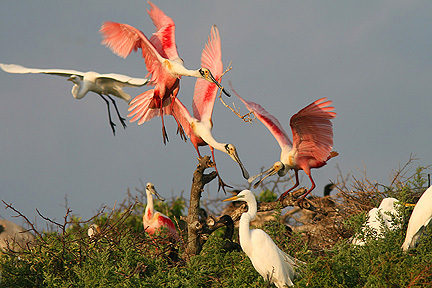 Over the past ten years bird watching has become the top tourist attraction for many towns along the Texas Gulf coast. 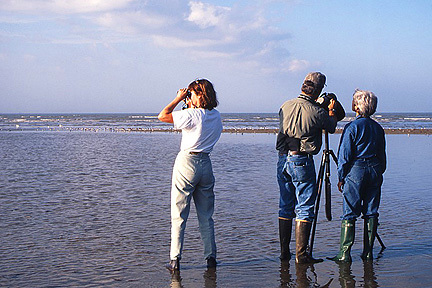 Birders or snowbirds as they like to call themselves flock to the Texas coast from northern locals every winter to take advantage of the warm weather and the winter bird migration. Other migratory birds you may see in the Rockport area include geese, hawks, ducks, loons and many verities of song birds. In addition to the migrants there are the year round residents such as egrets, herons, cormorants and rosette spoonbills. In the Spring a boat tour to one of the bird rookeries is a great way to see large numbers of wading birds. Connie Hager Cottage Bird Sanctuary located off Church Street in Rockport is also worth checking out. In spring migrants such as vireos, warblers, grosbeaks, flycatchers, and thrushes can be found in the oak mottoes. 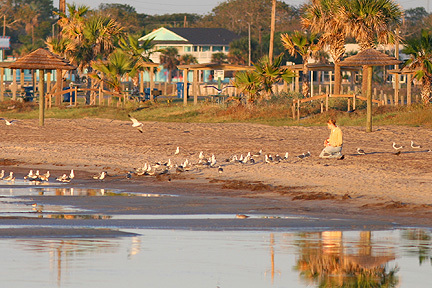 Once you're finished at Connie Hager just a short drive away is Aransas Bay and Little Bay, there you can find all kinds of waders, ducks and maybe even a rare sighting such as a frigate bird, osprey, even a red throated loon have been spotted here. If you like the beach then Rockport Beach Park is the place for you. What you'll find is a very clean and well maintained park with all the amenities you'll need for a relaxing and enjoyable day in the sun. Picnic tables, covered cabanas, restrooms & showers, playground facilities, a short exercise trail with work out stations, fishing piers, even a roped off saltwater pool. You can also launch your boat at the public boat ramp. Unlike some beaches where it can get a little unruly, at Rockport Beach it's very peaceful with most of the visitors families with kids. This is the perfect beach for just kicking back and relaxing. No pets and no overnight camping though! 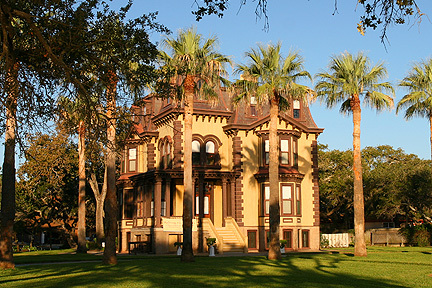 If you're in the mood for a different kind of adventure a trip to the nearby Fulton Mansion State Historic Site is definitely worth your time. A tour of the mansion will reveal what it was like living as an affluent family in the late 1800's. Built with many modern day convinces such central heat, gas lighting and running water it was truly a technological marvel at the time. The house was built by George Ware and Harriett Smith Fulton in 1877, originally it was called Oakhurst because of the oak trees that surround it. The 2.6 acre site was acquired by Texas Parks & Wildlife in 1976, it was restored then opened to the public in 1983. The site was transferred to the Texas State Historical Commission and declared a Texas Historic Landmark in 2008. For more Texas history a leisurely stroll around the Rockport Heritage District is a great way to spend a few hours. There you'll find the Aquarium at Rockport Harbor, Rockport Center for the Arts and the Texas Maritime Museum. The Aquarium's exhibits cover the Bays, Jetties, Sea Grass and the Gulf. In the 1200 gallon Bay tank you can watch as marine life such as red and black drum, sheepshead and Atlantic croaker interact. The Gulf tank is set up to resemble the near shore environment of the gulf, this tank is populated with grouper, snapper, squirrel fish and sea robins. 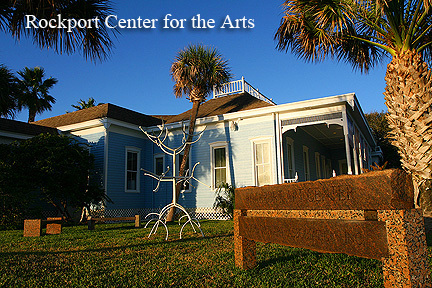 Just across the street from the aquarium is Rockport Center for the Arts featuring an outdoor sculpture garden and one of the best selections of coastal art in Texas. The sculpture garden includes many outstanding pieces from popular artist such as renowned environmentalist Kent Ullberg, his "Rites of Spring" is my favorite. James Surls "Walking White Flower" is one of the center's newest pieces ( see video below ). Inside you'll find three galleries showcasing sculptures, photographers, painters and potters. They also have a gift shop stocked with books and posters. 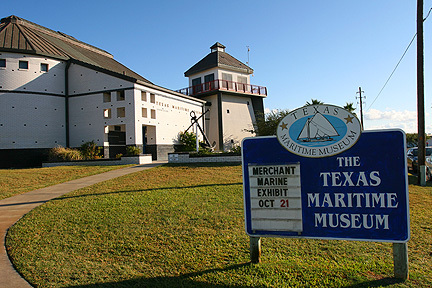 Next door to the Arts Center is the Texas Maritime Museum, if you're interested in Texas maritime history then this is the place to be. The museum is loaded with all kinds of exhibits filled with model ships, artifacts from shipwrecks, historic photos and posters, old fishing and boating relics, even a small library. The centerpiece of the museum is the 1:12 scale model of the Robert La Salla's flagship La Bell, it's a part of La Salle Odyssey, a collection of eight institutions, seven member museums and a half scale model of the La Belle. The museum has several types of permanent, temporary and outdoor exhibits. The permanent exhibits feature Exploration and Settlement, Oil and Gas Exploration, Commercial and Sports Fishing and Boat and Ship Building. 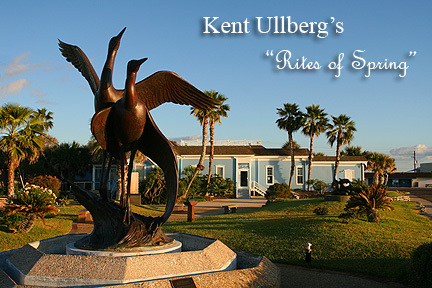 The rotating and outdoor exhibitions cover different aspects of Texas' rich coastal past. While you're there don't forget to climb up to the deck of the lighthouse for the 360 degree view of Rockport harbor and Aransas Bay. To help raise funds the museum hosts the annual Rockport Festival of Wine and Food. Don't forget to pick up some souvenirs at the art galleries and gift shops on Austin Street downtown. 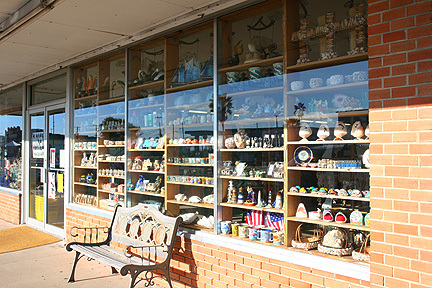 These unique souvenir shops carry everything from paintings, prints and photographs to sculptures, sea shells and model ships. Salt Flats Photography has some beautiful prints of Whooping Cranes and other birds and wildlife by photographer Diane Lyod. Latitude 28 02 is both a gallery and restaurant, they provide a venue for local and regional artists to exhibit their artwork. They represent over 70 of Texas' most accomplished artists. After a long day of touring museums and shopping you may want to treat yourself to some amazing seafood at one of the many outstanding restaurants in the area. Hemingway's Bar & Grill has great service and reasonable prices, their oyster's Rockefeller is really good. It's a surprisingly nice restaurant in such a small town. Texas born artist James Surls talks about his new sculpture "Walking White Flower" recently installed at Rockport Center for the Arts. 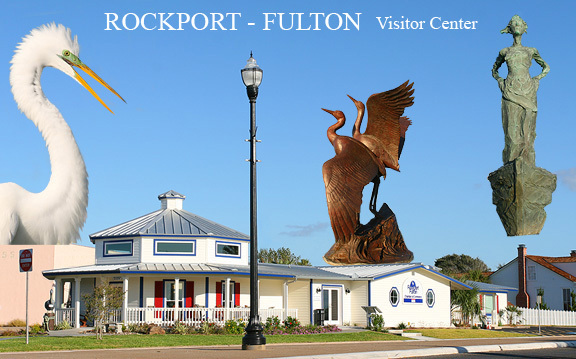 Rockport Chamber of Commerce presents an in depth video tour of the Rockport - Fulton area.